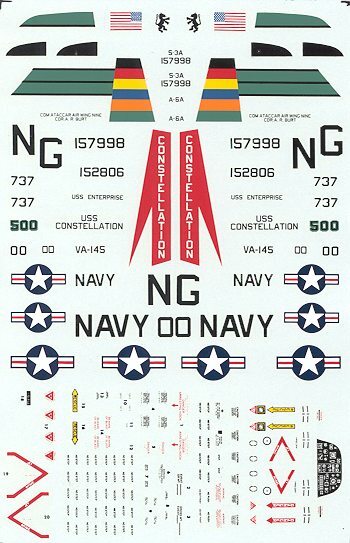 This is one of those neat Microscale sheets that included different aircraft from a particular Carrier Air Group. In this case, it is CAG-9, which was on the USS Constellation and USS Enterprise. As you probably know, the air group doesn't always stay on the same ship as the ship may be in for overhaul and the wing will shift to a ship that has just come out of overhaul. On this sheet are two very interesting/colorful aircraft. Both are painted gull grey over white, the standard camo scheme of the time. The first one is an A-6A from VA-145. This is the CAG bird so has the colors of all squadrons on the ship in the tail. The other is one of the first US-3As. The US-3A was originally painted overall white (at least the first one I saw in 1979 was that color). Later they were painted in standard colors. The US-3 was assigned to whatever S-3A squadron was deployed on the ship at the time and so took on that unit's squadron design for the tail. It wasn't until later that they were all assigned to VRC-50 and repainted in overall white. The best kits to use for these aircraft are Fujimi and perhaps Italeri for the A-6A and Hasegawa for the US-3A. You'll have to remove the wing tip pods for the US-3 as well as the tail boom and SRS antennas, but otherwise it will be a simple modification to make. As a bit of a side note, you'll notice that there are only two turbine warning markings for the S-3. You'll need to get the other two from the kit.